Hi Really Reasonable Ribbon friends and fans! Today I have another super easy Christmas/Holiday themed card to share with you. I have gone with a bit of a more rustic feel with a twist of vintage Christmas paper and classic red ribbon. I have used a couple different layers of cardstock to create my layout. I added a wrap of Poppy Red Taffeta Ribbon and then tied a double bow. I then made several loops with Bakers Twine-Christmas themed twine. I took two paper mittens and strung them from the twine. I added this behind the red bow along with a flower filler in white. 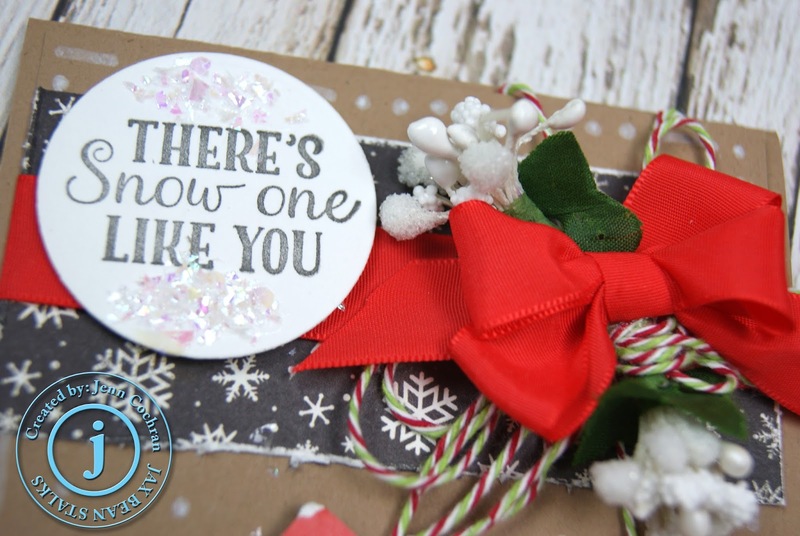 I then added a fun Christmas sentiment on a round die cut circle. To complete my card I took a white chalkboard pen at added "snow dots" to the kraft cardstock around the mittens. To finish the vintage themed card I added a bit of iridescent snow to my sentiment. Thanks for joining me today at RRR. Hope you have a crafty rest of your week! Wow! your card is gorgeous! The ribbon and twine on the card looks very lovely. Awesome card design, just the right elements and just enough of them! Perfect! This is stunning! I love all of the details to this, gorgeous! Lovely! This makes me think I should start thinking about making my Christmas cards. It is something I love. I don't do ribbons well, so I am admiring yours. Your card is so beautiful! I love the mittens. Oh gosh these are so cute! I love the phrase! And the bags are perfect for pretty much anyone! Thank you for sharing! SUPER cute, Jen. I really love the mittens. Great job! THis is amazing! So incredibly cute! Jenn, you did a beautiful job with the Christmas card and the cute mittens. 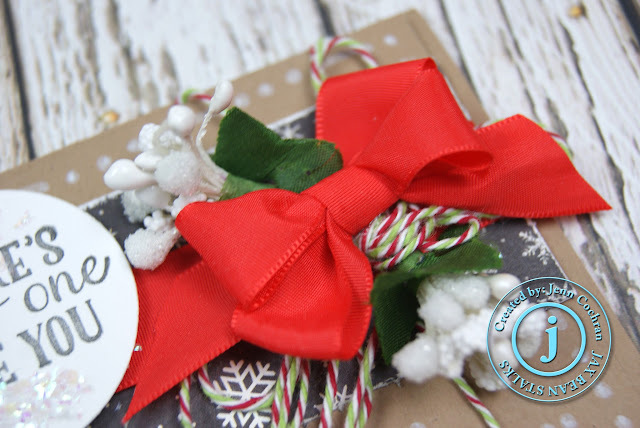 What you did with the bow and beautiful ribbon gave your card that "Wow" look.